The Kingdom of Prussia at its greatest extent (in blue), at the time of the formation of the German Empire, 1871 (in tan). 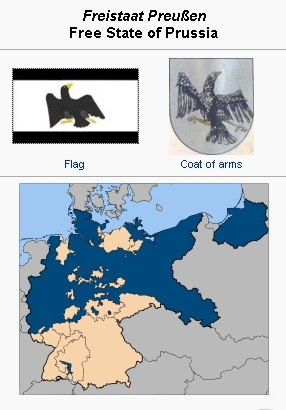 The Free State of Prussia (blue), within Germany (tan) at the time of the Weimar Republic. 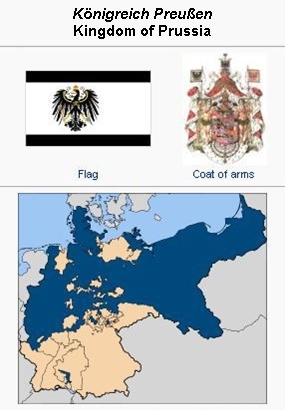 Prussia was an earlier designation for the territory that later became the provinces of East Prussia (previously Duchy of Prussia or Ducal Prussia) and West Prussia (previously Polish Prussia or Royal Prussia), and in 1701 the Kingdom of Prussia, ruled by the Hohenzollerns, having orig­inated from the Electorate of Brandenburg. After World War I Prussia became a Free State, and after World War II it was dissolved. 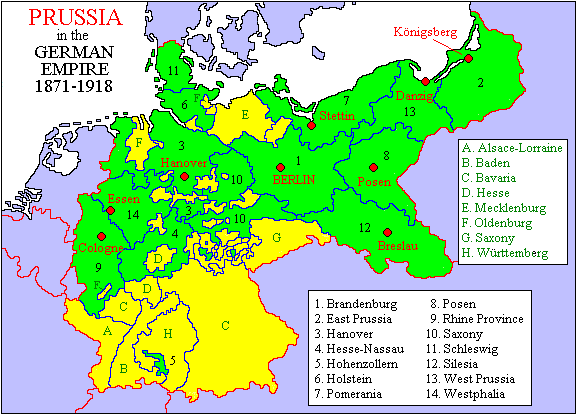 In 1914 Prussia consisted of the "old provinces" (acquired before 1866) of East Prussia, West Prussia, Pomerania, Posen, Branden­burg, Saxony, Westphalia, and the Rhine Province, and of the "new provinces" (acquired in 1866) of Schleswig-Holstein, Hanover, and Hessen-Nassau. In 1850 the principalities of Hohenzollern were add­ed. In 1854 the principality of Neuenburg and Valengin (today the Swiss canton of Neuchâtel) was given up. The rulers were Friedrich I until 1713, Friedrich Wilhelm I until 1740, Friedrich II (the Great) until 1786, Friedrich Wilhelm II until 1797, Friedrich Wilhelm III until 1840, Friedrich Wilhelm IV until 1861, Wilhelm I until 1888, Friedrich III 1888, and Wilhelm II until 1918. In Pomerania, Posen, and Silesia there were no great numbers of Mennonites. Within the other parts of the state the various groups of Mennonites long developed in regional independence of each other, also in relation to the state. Friedrich Wilhelm I took a very different attitude toward the Mennonites in East Prussia than to the Men­nonites in Krefeld. Friedrich II granted spe­cific privileges to the settlements in the Netzebruch in 1765 and to the Mennonites in the East in 1780. In 1830 Friedrich Wilhelm III, after careful preparation, issued a law particularly designed for the Mennonites in the West. But the Order of Cab­inet of 1827 concerning the oath was valid for the entire state; likewise the elimination of exemption from military service of 1867, the permission grant­ed the old Mennonite families to do noncombatant military service, and in 1874 the law concerning the rights of the Mennonite churches to incorporate. Crous, Ernst. "Prussia." Global Anabaptist Mennonite Encyclopedia Online. 1959. Web. 25 Apr 2019. http://gameo.org/index.php?title=Prussia&oldid=103313. Crous, Ernst. (1959). Prussia. Global Anabaptist Mennonite Encyclopedia Online. Retrieved 25 April 2019, from http://gameo.org/index.php?title=Prussia&oldid=103313. Adapted by permission of Herald Press, Harrisonburg, Virginia, from Mennonite Encyclopedia, Vol. 4, pp. 224-225. All rights reserved. This page was last modified on 11 November 2013, at 23:40.